Made up a 4-way voltmeter for half of the battery bank. I'll use this to watch out for "bad" cells". Got the last solar PV back on the roof and all connected up. They blew off because I had left some of the mounts unbolted, as I'd run out of time on the day. It was one of those jobs that was on my list of things I really should get to. All but one of them was fine! The one damaged one had it's glass shattered. I'll see if I can save it my resealing it with clear epoxy. But for now I've just remounted four of the panels (more securely this time) - the pair of 80 Watt panels are now connected back up to the 250 Watt Micro Grid-Tied Inverter. 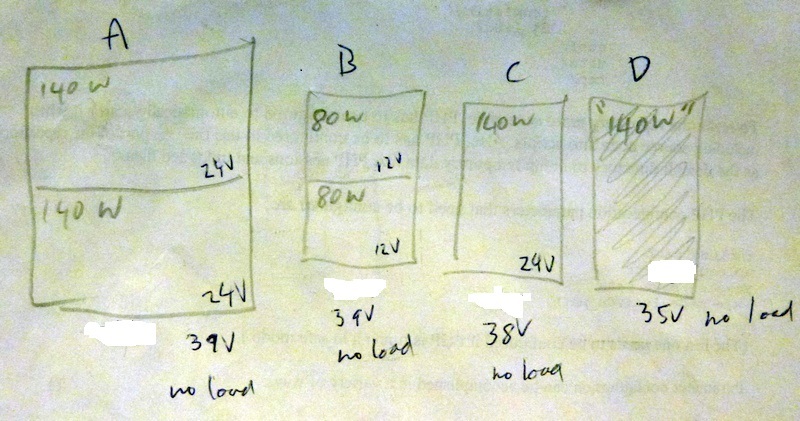 Once I've got some new connectors I'll hook up the pair of 140 Watt panels to a 500 Watt Micro Grid-Tied Inverter. Remount the remaining good 140 Watt PV panel and connect it back up to my batteries. I'm also working on building a battery voltage monitoring board. 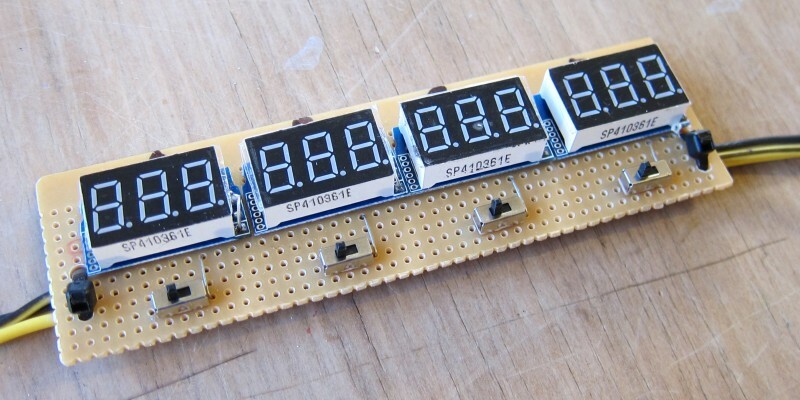 It'll measure the voltage of each of the eight batteries individually. Bought 50 x 12v 1.2W thinfilm solar cells via Trademe seller "powertech1" (dale.bradly@powertech.co.nz). They are 225mm(L) x 140mm(W) x 3mm glass with the silicon material printed on the rear, along with solder tabs. Now I need to work out what to do with them. The challenge is they're already 12 volts. Normally soalr cells are much lower voltage than that and you string them in series to build up to 12 or 24 volts. It's not a good idea to string them in series because each cell will produce slightly different voltage - so if they were in series they'd fight each other. It would make some sense to string them in series to make a high voltage low current output. But what's a good application for that? I'm now running 2 x 80 watt panels (wired in series) into 8 Trojan batteries (900 AH), driving a 300/600 Watt inverter. Connected a new 250Watt micro grid-tie inverter (a SUN-250G, 22-60V version from "Ningbo National Hi-Tech Park Sunshine Technology" in China.) to two of my 80 watt panels (wired in series). Along the way I learned how to fix a corroded solar panel junction box. Currently running 240 Watts, 12V Solar PV (3 x 80 W) into 6 Trojan T105 batteries (675 AH), driving a 600Watt inverter (12 VDC to 230VAC), powering the weather station and its laptop (which updates the web site). The system makes no financial sense what-so-ever - but it does increase my energy independence slightly and it's a fun experiment. My plan is to add another 80 Watt panel every year, more batteries, then upgrade to 24 volts (which will require a new inverter). My next goal is to build it up to the point where it can power the 230volt 190 Watt web server that this site runs on. Add 2 more batteries - Exide sells Trojan T104's direct to the public at the best price I've seen. This would bring my total up to 8 batteries and 900 Amp-Hours. Add pure sine waver inverter to drive the web server (300 Watts would do). My server does not like the current 600W modified sine wave inverter I am using (which runs the weather station). Invertek HF Inverter - 1500W 12/24VDC Pure Sine Wave, NZ$800, 83-86% efficient, Below 1-Watt consumption in power save mode.